Before I start, let me state that I have very little use for the term race. I hate the notion that because people have different phenotypes they are somehow members of different races. Homo sapiens are of the human race. We have a variety of phenotypes. Whether you believe in creation like I do or evolution as do others, phenotypes are a blessing. For example, the narrow eyes of the Inuit people are helpful to them since they live in an environment with a lot of wind and cold. Along those lines, it makes sense that people whose lives began in the African continent, where intense sunlight is a constant, have dark skin. Ms. Sykes made a very profound and true statement. It raises the question, is Mr. Obama black or is he mixed? 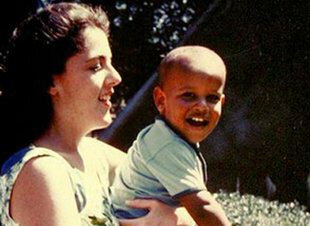 Here is a really beautiful picture of him with his mom, the late Stanley Ann Durham, Ph.D.
She is white (I hate the term. I’d prefer Steve Bico’s assessment that we are pink.). His dad, Barack H. Obama Sr. is black (another term I am not fond of). Mr. Obama is mixed. That’s a great thing. I think the more society becomes comfortable with the idea of mixed marriage, the sooner it will start to think of it the right way, just plain old marriage. In my life as a minister, I had the privilege of marrying three mixed couples. The ones with kids have mixed kids. This begs the question, does America have a black president? How black is black, white is white, etc? If Melia Obama marries London Emilio Hudson, what box on the Census form will their children check? Do I have to eat green ham? Question one is easy to understand although not easy to answer. Question two requires you to do some homework. Question three is autobiographical. In 1981, I was a private in the U.S. Army. As a private in Basic Training, I had no individuality, no prerogative, and few occasions to be creative. Then, one afternoon in the chow line of Ft. Dix, N.J., I had a chance to be all three. We formed two perfectly straight and sweaty lines of cannon-fodder-in-training. The line of grunts on the left was given spaghetti and meatballs. The line of grunts I was in got ham. There was one problem. 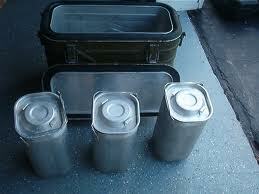 When the Army prepared field rations in garrison, it stored them in these contraptions called mermite cans. A mermite can is a large insulated aluminum container that has hot water and three non-insulated aluminum cans dropped in it. It is sort of a cross between a double boiler and a thermos. The mermite can did a decent job of keeping food warm. It also had a tendency to turn it green, particularly eggs and ham (Dr. Seuss would have approved). When I saw the green ham, my heretofore unused brain kicked in. The green ham looked nasty and I didn’t want it. I wanted the meatballs. I told my drill sergeant that I could not eat the ham. As he prepared to have me perform enough push-ups to make my triceps bleed, I whipped out my dog tags that said “Reformed Judaism” at the bottom, right next to the notch that was used to facilitate ramming one of them between my front teeth should I meet with my untimely death on the battlefield. The drill sergeant pondered the situation for a moment. He pointed to the meatballs. I ate them and then faded back into O.D. green uniformity. What does this have to do with the subject of the United States having (or not having) a black president? It’s simple. I was born and raised Jewish but at the time, I wasn’t practicing any faith. I pulled “the race card” on that hot summer day for one reason; it served me. It was not because I identified myself with the fledgling nation of Israel. It was not because I had some overwhelming sense of Jewish pride or identity. It was because I wanted something and I was willing to identify myself with my ethnic group in order to get it; just like the guy who used to be known as Barry. This entry was posted in Philosophy, Politics, Things that make me wonder and tagged barack obama, barry obama, biracial, black, discrimination, disingenuous, interracial marriage, mixed, mixed marriage, obama, presidential election, race, Stanley Ann Durham, sykes, the race card, white. Bookmark the permalink.